This weekend I’m going backpacking in Shenandoah National Park! Shenandoah is the first place I ever went backpacking and one of the loveliest places on Earth. Today, in between learning all about Mercury (the planet, not the element) and interviewing planetary geologists, I’m sorting through gear and packing my backpack for the weekend. When packing for a backpacking trip less is always more: The less you carry the more you’ll enjoy your trip. In theory, I aim to keep my pack under 25 pounds (without extra water), but since I don’t have a luggage scale (or any other kind of scale for that matter) my actual goal is to be able to lift my backpack easily and swing it onto my back without help. 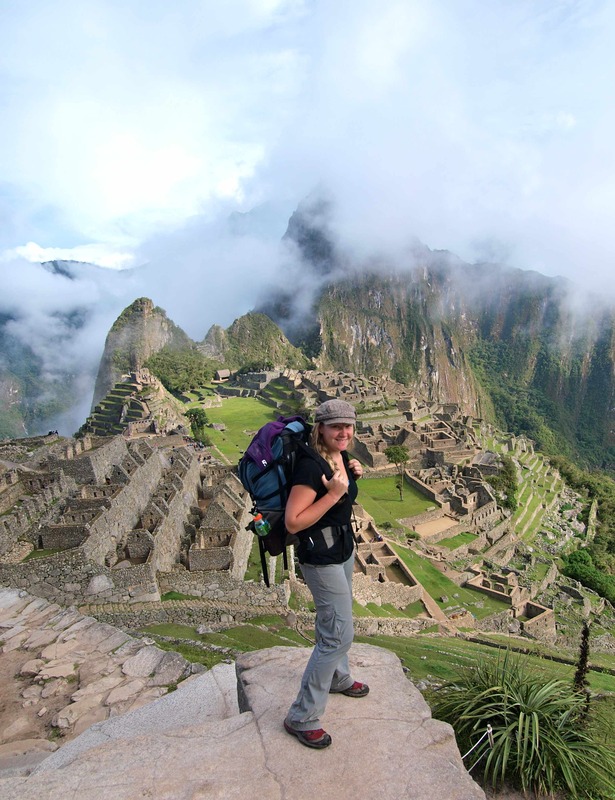 On the first backpacking trip I ever took – a 4-day suffer fest on the Appalachian Trail – I could barely lift my pack and I needed help from a rock or a tree or another person to leverage it onto my back. I suffered on that trip and it’s a wonder I fell in love with backpacking anyway. Bowie on our very first backpacking trip. Now that’s a happy dog! 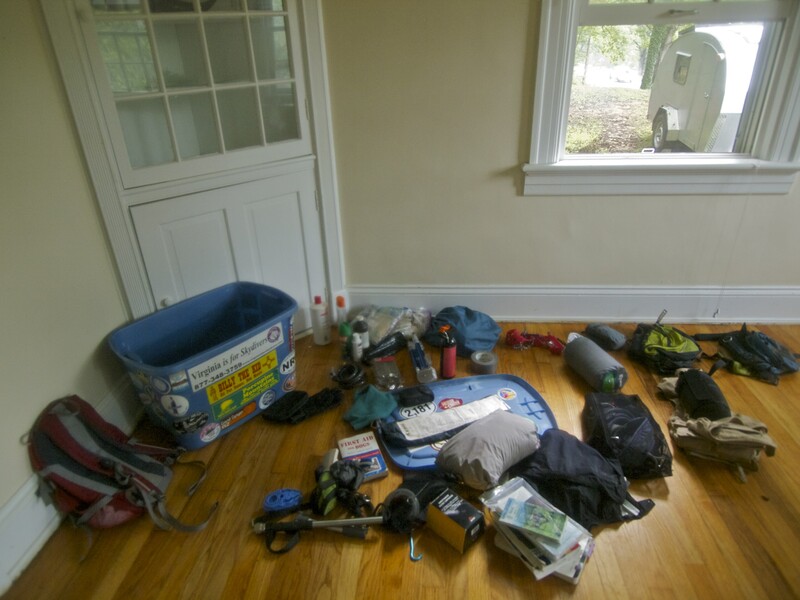 Packing for backpacking is like packing for any other trip in that you have to constantly fight the urge to throw in extras: extra clothes, extra food, extra bug spray. But when you have to carry your suitcase on your back for days on end, up and over mountains and across fast rivers, every ounce counts. Here’s my basic gear list for this weekend: 2-person backpacking tent, synthetic 20° sleeping bag, z-lite sleeping pad, headlamp, bear bag to hang food & 30 feet of cord, 3-liter platypus water bladder and a 1.5-liter water bottle, water filter, waterproof pack cover, topo map, first aid/ survival kit (more on this later), bug spray, sunscreen, travel toothbrush and tooth paste and travel deodorant. The Appalachian Trail is blessed with shelters every 10 miles or so – we’ll pass two this weekend – but I’m still packing a tent because: 1. shelters are meant for thru-hikers and 2. I finally got a new tent! I’ve been hemming and hawing about needed a new tent for over a year now. My old trusty EMS Starlight II tent hasn’t been waterproof in awhile now, despite regular re-waterproofing treatments. After trying and returning a Big Agnes Jackrabbit-2 tent (way too flimsy for regular use with two dogs) I decided on an REI Half Dome 2-plus tent, which should be light but roomy and durable enough for two people and three dogs. Sorting through my gear box. Notice the Teardrop parked outside! As for clothing the forecast is calling for scattered thunder showers this weekend so I’ll be wearing long synthetic pants and a synthetic t-shirt (no cotton! in wet weather cotton kills!) and bringing a light jacket, a rain jacket, a warm hat, a down jacket, (also doubles as a pillow) and one pair of socks per day, plus an extra pair. Always always always pack extra socks! For footwear I’m going with my trusty Salomons. I’d kind of rather wear my waterproof Asolo hiking boots, but they’ve been rubbing my heels lately and I need to keep my feet in good condition. And, of course, I’ll be bringing my camera. For an overnight trip, that’s really all I need. Also, note that I’m not bringing a stove. For 2 days in relatively warm summer temps, I can make due with granola, snacks and sandwiches. That saves me not only the weight of the stove, but also all the cookware. 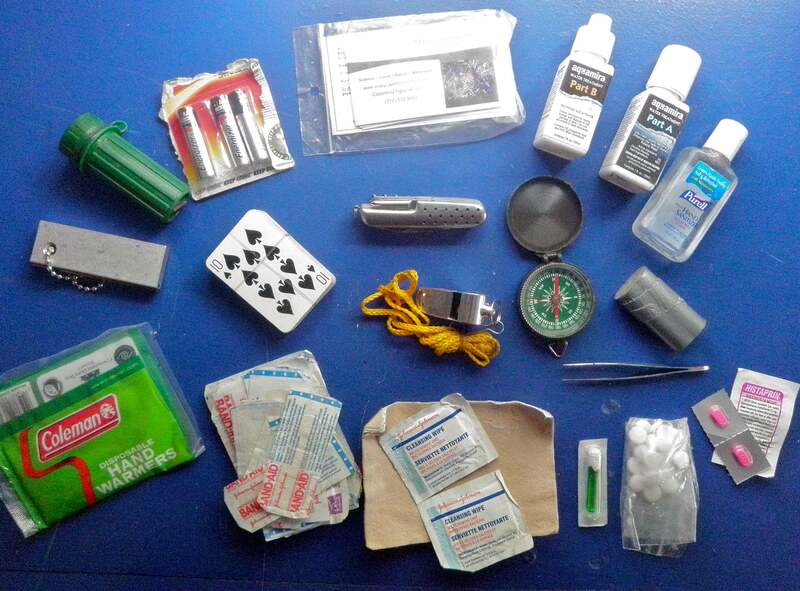 As for the first aid/ survival kit: back when I was living in Oregon I took a wilderness survival course and as part of our final exam we had to assemble a first aid/ survival kit that would fit in a ziploc bag. I carry this kit on every hike, even on short jaunts around my backyard. • Warmth- hand warmers, magnesium fire starter and waterproof matches. All the fire starting materials in the world won’t help you unless you actually know how to start a fire. It’s not as easy as you might think. If you’ve never done it- practice! You don’t want to have to learn in an emergency. • Light- extra batteries. My headlamp takes 3 AAA batteries, so that’s exactly what I carry. • ID- I carry a photocopy of my insurance information as well as a few of my business cards, one of which has my emergency contact numbers written on the back. • Water- Back east I often carry a MSR SweetWater water filter, but out west in the mountains I usually only carry AquaMira water treatment drops. I’ve been using these for years and have yet to get sick (knock on wood). • Basic First Aid- hand sanitizer, Benadryl, OTC pain killers, bee sting and alcohol swabs, tweezers, blister/ wound kit: bandaids, gauze, moleskin, Neosporin and duct tape. I also pack vetwrap for the dogs and a handkerchief. • Playing cards- Ok, so these aren’t strictly for survival but they come in handy. • Real knife- you’ve seen 127 Hours, right? Pack a real knife. • Whistle- carries much farther than your own voice. • Compass- this thing is useless if you don’t know how to use it. Navigating by compass isn’t intuitive. Sign up for a compass navigation course through your local REI. Also, pack a topo map. This dinky thing is really just my back up because I also carry a Timex Expedition watch, which functions as a compass, altimeter and barometric pressure gauge. So that’s about it. The dogs know something is up and both are laying out by the car so I can’t forget about them. I don’t think I’ll make Dio carry a pack this weekend. On multi-night trips, he usually carries his own food. 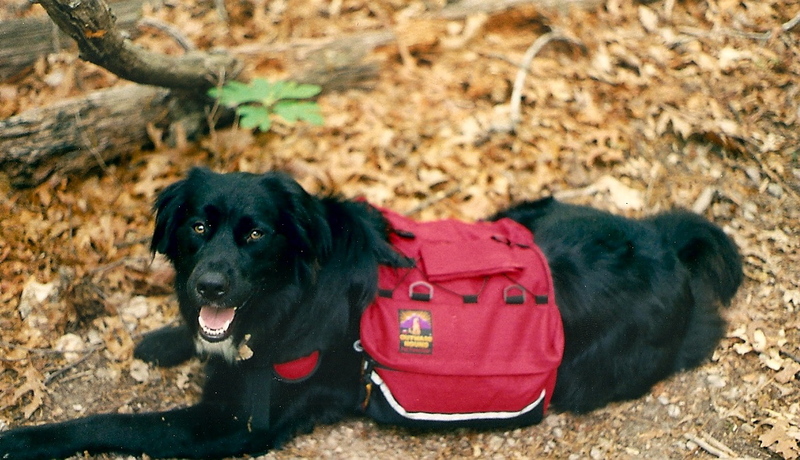 Bowie is ten now and retired from carrying a pack. He doesn’t need any extra weight on his hips and shoulders! If you have any questions about gear or want advice just ask! A lot of my gear (pack, sleeping bag) is a few years old and somewhat outdated – I prefer to use my gear until it’s done – so I haven’t posted links to everything I own. I’m happy to give insight and advice if you’re looking to buy new gear. Anybody have any other backpacking packing tips? Stuff on my list you’ve learned to live without or things I’ve skipped that you can’t bear to leave behind? Remember, minimalism is awesome, but don’t forget the 10 Hiking Essentials. 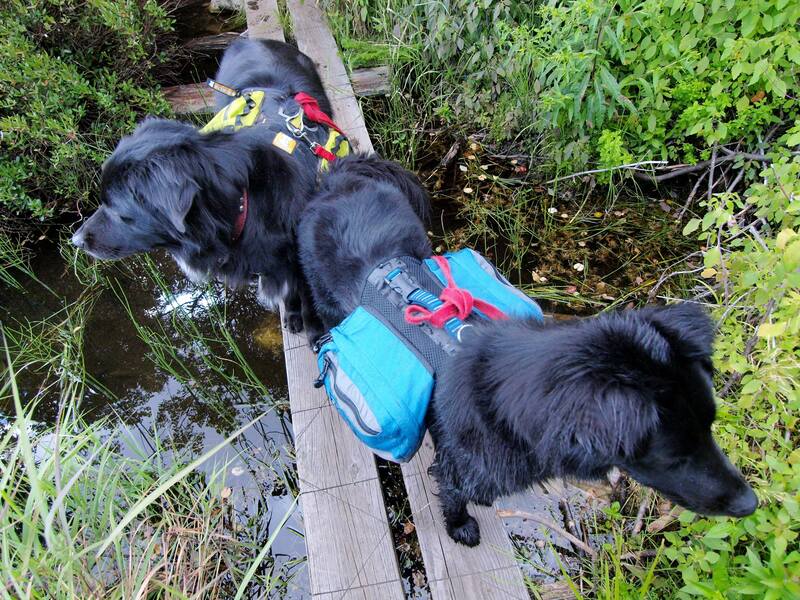 Don’t hit the trail without them! 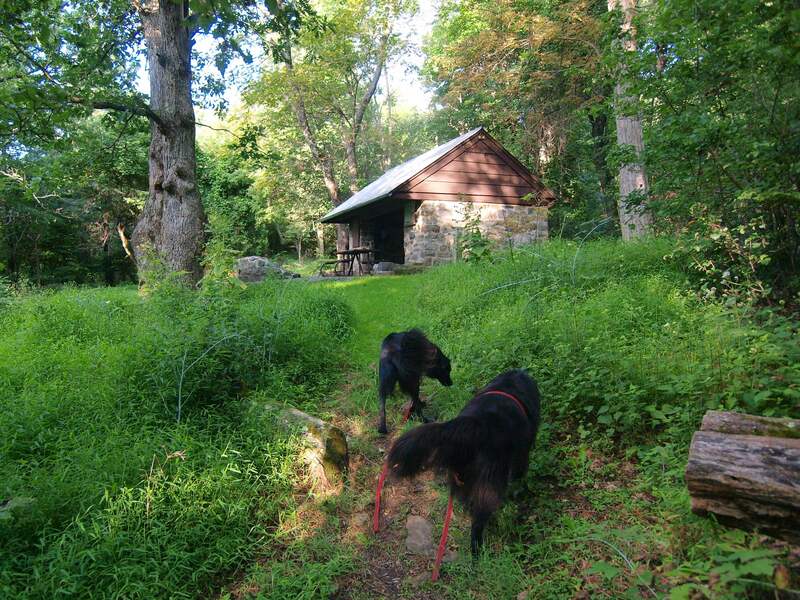 This entry was posted in Appalachian Trail, Bowie & D.O.G., Hiking!, Photography, Teardrop Trailer, Vagabonding 101 and tagged backpacking, dogs, gear, hiking, packing, shenandoah national park, survival. Bookmark the permalink. 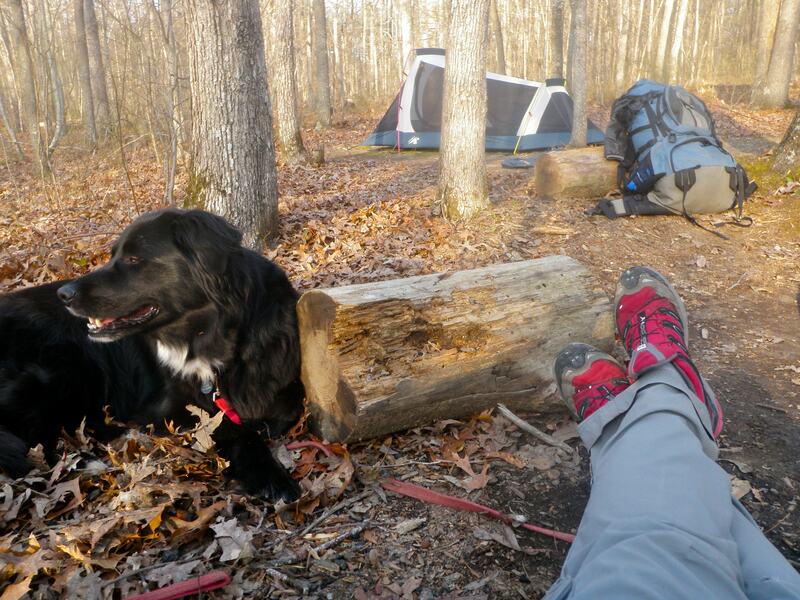 6 Responses to Packing for Backpacking: Shenandoah! Packing for an backpacking trip is always so fun and simultaneously so stressful for me. I probably over-think it! Something I think is worth mentioning is that while it is important to go light, it is a fine line between minimalism and being unprepared (I learned this the hard way when I brought a tarp instead of a tent on the Lost Cost Trail and had to turn around after one very miserable night). It takes experience to learn what to cut out and what you can’t live without, and it is different for everyone. Personally, since I backpack solo a lot, I can’t live without a god book. It’s extra weight but well worth it in my opinion. Great post and have fun! I’d add a needle and thread and a mini-Bic to the kit. And I’d rotate those hand warmers every year or so, they get pretty weak sometimes. The ID is a great idea, I never thought of that. They can identify my remains quicker that way! Loved seeing your list. Clifford and I just returned from backpacking to Nambe Lake this weekend. (Have you hiked there? – I think you’d love it, although it is not far compared to most of your outings) We have our list of essentials and ‘extras’, but are always trying to cut back on the weight. I’d like to take more time to look at your list and see what we can learn. I do know, however, that having hot food is something we consider essential. We have a very light-weight butane stove that we take. I’ve been drying veges to add to raman for a hot soup for lunch and we take dried refried beans for dinner. Use a campfire for as much cooking as possible so as to minimize the butane that we carry. Other differences, also, but I do appreciate seeing your list and thinking how we might streamline our packs. That just looks like an amazing adventrue! I bet your dogs were just living it up! Wish we could get away with 25 pound packs — my husband and I usually carry about 40 pounds because we go backpacking in the desert and with little ones that can’t carry their own water! Just seeing the gear out is exciting . . . have a great trip!